It can be very helpful if teachers provide students with clear typed or word processed notes rather than handwritten ones. Type should be clear and well separated, using a minimum of size 12 or 14. Sans serif fonts are best, e.g. Arial, Comic Sans, Verdana, Helvetica, and Tahoma. Use lower case or sentence case, as using all capitals can make it harder to read. Some people with dyslexia will benefit from information being photocopied or printed onto coloured paper. Some people find that they get less glare or experience less visual stress when using colours. Some individuals use coloured overlays, which they place over the textbook. It is also possible to change the font colour and background colour on the computer. Colour coding key information can aid memory; using different coloured highlighters, or colour coding in documents, should be encouraged. Provision of visual information can be very beneficial for some learners; include pictures, diagrams, charts and mind-maps. Some material is available on CD, audio book or digital book format, particularly English novels, drama and even some poetry. This can be accessed through most good bookshops, libraries or online. OverDrive is an app for tablets and smartphones which allows borrowing of digital and audio books from local libraries and www.audible.co.uk is a subscription service for high-quality audiobooks. There are also numerous websites where cheap or free digital copies of novels can be downloaded, such as www.epubbooks.com. DVDs may also be available where novels or dramas have been filmed. These would all be good interactive learning tools. Some students may benefit from recording lectures, or even recording their own study notes. They can build up their own audio library which they can then use for revision. An MP3 player or iPod can be used so that the student can listen to their class or study notes while travelling on the bus. 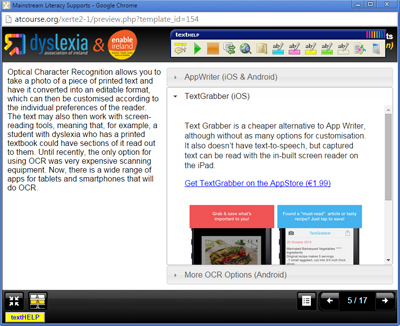 There are also numerous apps for tablets and smartphones that would allow students to record their own notes. An electronic dictionary is an in-expensive, portable tool for checking spelling, e.g. Franklin Spellmaster or Collins Electronic Dictionary and Thesaurus. As long as the individual can make a reasonable phonetic attempt, there is a good chance that the correct spelling can be identified. Some electronic dictionaries also have a thesaurus feature which can help with expanding vocabulary. There is also an app called Dictionary, which is available for Apple and Android products, that allows the user to either type or speak a word in order to search for it. The app can then give the correct pronunciation, spelling and synonyms.